[New York Times] Features Franklin, Tennessee! 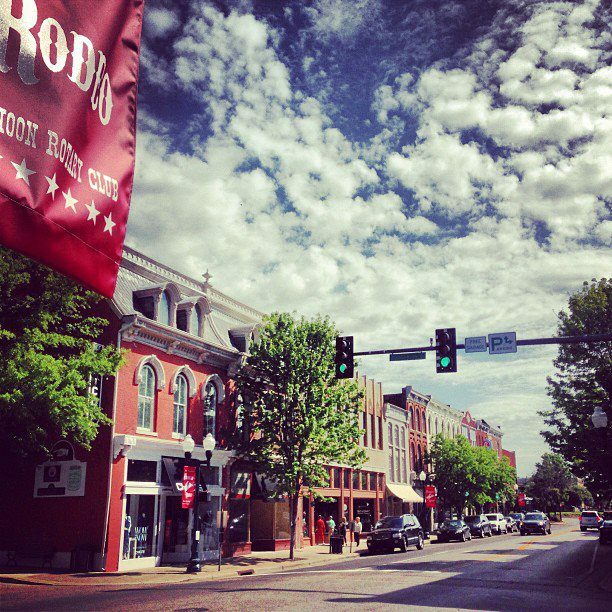 On Oct. 24, 2014, The New York Times published a glowing piece on Franklin, Tenn., calling it a “small-town gem near Nashville”–and downtown Franklin is proud to say that several of our members and downtown attractions were mentioned in the article! It was Sunday night at the Cork & Cow. Around 6:30, four girlfriends met at the bar to have salads and Champagne and review the weekend. There was a nice hum in the dining room, where six couples had assembled at a long table along the tufted green banquette. At least a few of them had come for the weekly special that February evening: a $20 prime rib dinner and half-price bottles of wine. My sister and I had spent the day in Nashville and just wanted a quick bite, so we popped in to share some brussels sprouts and warm bread that came in a small cast-iron skillet. Service took a while, but no one seemed to mind. This is the pace of the South. The steakhouse is in a two-story brick building on the corner of Main Street and Fourth Avenue South in downtown Franklin, Tenn. It’s not far from the town square, which is marked by a monument to the Confederate soldier, and across from a toy store that sells little wooden pickup trucks and novelties like garlic chewing gum. In recent years, a Starbucks and an Anthropologie have moved in along this five-block stretch. But it’s like a fantasy of small-town Main Street: brick sidewalks and cobblestone crosswalks, antique street lamps alternating with trees along the curb, wood-framed storefronts housing independent businesses, some spanking new, and well-preserved, low-slung buildings from the early 1900s all in a row. Franklin is a Southern gem hiding in the shadow of Nashville, less than 20 miles north. Some call it a suburb of Music City — and plenty of farmland has been developed into subdivisions, strip malls and office plazas — but Franklin is a world away, with a history and culture all its own. Founded in 1799 and named in honor of Ben Franklin, the town is speckled with American artifacts, from Civil War bullet holes in the side of an outbuilding at the Carter House to a red brick factory with a tall, skinny chimney that produced Magic Chef stoves until 1959. The 16-block historic downtown and three small residential districts that surround it won National Register of Historic Places status in 1975. It’s the kind of place where names on the slanting gray gravestones in the old cemeteries match the names of today’s prominent businessmen and local track and field stars. Maybe it doesn’t possess Savannah’s sultriness or the pedigree of Charleston, but the tea is just as sweet in the rolling hills of what the people around here call Middle Tennessee. I never would have found Franklin if it weren’t for my sister, Lizzie. She moved here in 2009 with her family when her husband was hired as the head of the middle school at Battle Ground Academy, a private day school that was established in 1889. By now, I’ve visited often enough to see the place evolve and to witness the prosperity that is spilling over from Nashville’s boom times. Big corporations like Nissan have moved into the area, once a purely agricultural economy, bringing enough people and money to support a Whole Foods and tasteful new apartment complexes. And yet the place retains its small-town character — the population is barely over 66,000 — and a lovely old horse farm sprawls atop a hill overlooking the football field at the school. Once, while the children were in school and Lizzie had the day off work as a nurse practitioner, we went rummaging around the Second Avenue antiques district, a “district” that’s the size of a postage stamp and spread among an old flour mill and a few houses that date from the early 1900s but draws an international clientele. Among the stalls at the Franklin Antique Mall, opened some 30 years ago, you can find everything from a circa 1940s fat-man cookie jar and good Irish lace to a copper weather vane in the shape of a rooster and a cache of tarnished flatware, some of it sterling. Floors are uneven, ceilings are low, and there is plenty of mustiness, but in the warrens it’s possible to find a treasure. There, up on a high shelf, alongside a couple of wooden buckets, sat a dusty rose pitcher. “Could I see that, please,” I said to the woman with reading glasses on a chain. “What, darlin’?” That pink pitcher, please. She brought it down, and lo, it was an authentic Russel Wright, from the early ’60s, which I could snap up long before it ended up at the nice new shops in Hudson and Rhinebeck and other bustling towns in the Hudson Valley in New York. The price was $50; I offered $25; the woman made a phone call; sold! for $30. (Later I found one of similar vintage on eBay for a starting bid of $79.95.) My sister was a little embarrassed by my haggling. “She’s visiting from New York City,” said Lizzie to the woman, who went to look for Bubble Wrap. The change is perfectly obvious at Frothy Monkey, a branch of the original coffeehouse in Nashville. Against a backdrop of repurposed wood, exposed pipes and sustainable practices, in a converted house across from the First United Methodist Church, the late-morning crowd reveals a creative class that’s migrated into town. Small groups hatch plans over carrot muffins, a young couple sports footwear from Isabel Marant and Yohji Yamamoto, students from the local O’More College of Design get Americanos to go, and parties of one hunch over MacBooks. Of course, there are some who have quit their day jobs. Plenty of the big names who play in Nashville live in Franklin, some out toward Leiper’s Fork. It’s worth taking the 15-minute drive to the village where older folks in Carhartt meet for lunch at the Country Boy Restaurant, and the original Puckett’s Grocery and Restaurant sits behind a single gas pump in all its ramshackle glory. Leiper’s Fork would be a complete time warp except for the housewares shop that sells antique dish cupboards for $1,295, the David Arms Gallery in a converted barn, and the sophisticated security systems of the secluded estates all around. A refugee from New York bought a farm there and now features its fruits at Joe Natural’s Farm Store and Cafe. A few weeks ago, as I was heading back to have dinner with my niece and nephew in Franklin, I took a back road through countryside reminiscent of an English landscape, with cows and streams and stone walls and clouds skimming the tops of the trees. Oh beautiful, for spacious skies, as the song goes. Frothy Monkey, 125 Fifth Avenue South; 615-465-6279; frothymonkey.com. Cork & Cow, 403 Main Street; 615-538-6021; corkandcow­.com. Open for dinner. Dotson’s Restaurant, 99 East Main Street; 615-794-2805. An old-school meat-and-three with first-rate fried chicken. Gray’s on Main, 332 Main Street; 615-435-3603; graysonmain­.com. A gastro pub in a recently rehabbed old pharmacy that’s good for lunch and has music at night (plus a private club on the top floor). In the sprawl, there are any number of chain hotels, from Marriott to Drury. For a more local flavor, try the Jefferson House, from about 1900, in the historic district, with three bedrooms and a leafy garden; from $200 per night with a two-night minimum; 615-281-0401; vrbo.com/3495690ha. In Leiper’s Fork, set up at Brigadoon, an enchanted little house built in 1885, appointed with an assured style that might stop Ralph Lauren in his riding boots. It’s comfortable for four; weekend rate, starting Thursday, is $250 per night, plus a $125 cleaning fee; 615-281-0401; vrbo.com/337233. The historic downtown is compact and best seen on foot. At the visitors’ center on Fourth Avenue North, just off Main Street, pick up a map that covers the town in six walking routes, divided into themes like Historic Homes and Haunts & Headstones. (There’s also an app — and loaner iPads.) For something more bucolic, explore the trails of Harlinsdale Farm, a former Tennessee Walking Horse compound that’s now a public park. The Brooklyn Flea has nothing on Franklin’s antiques district at Second Avenue South and South Margin Street. Haven (343 Main Street, sanctuaryofstyle­.com) sells Helmut Lang trousers and books from Assouline out of an old grocery with original wooden elevator; French’s Boots & Shoes (328 Fifth Avenue North; frenchsbootsandshoes.com) has the latest cowboy boots and secondhand Uggs. Rare Prints Gallery (420 Main Street; rareprintsgallery.com) is as much museum as retailer of old engravings. The Civil War sites — the Carter House, Lotz House and Carnton Plantation — are eerie reminders of the Battle of Franklin in 1864, one of the bloodiest of the war. The guided tours take time, but you can get admission to all three for $30; carnton.org. A version of this article appears in print on October 26, 2014, on page TR4 of the New York edition with the headline: A Small-Town Gem Near Nashville.